Also available in Adobe® pdf format here. There must be a reason you want to write. What do you want to say? That society is morally bankrupt? That you hate war? Think about it. Decide on your themes and write them down. Build it into a story around characters that can carry the load. Write a six to eight page synopsis. The sooner you KNOW your characters, the easier writing becomes. To become a good writer you need an arsenal of tools, beginning with the best dictionary you can find. Build with a Thesaurus, a synonym finder, books on regional slang, misspelled words, travel books, street maps, menus, etc. Everywhere you go, gather materials. You never know when they might prove to be useful. It's important, even critical, to carve time from your schedule to write and to make a place where you will work. It doesn't have to be a separate room or an ironclad schedule, but writers need routine. And to that end, it's good to be able to say to your friends, I'll be working from eight until one, so please call me after that. Focus is your key and ringing phones are your enemy. Outlines are important for your story and to figure out how you will SHOW your theme. What action was going to happen when? Use the outline as a roadmap, trying to minimize detours. They waste ink and bore the reader. Know where you are going! That old crock about characters coming to life and taking over is mutiny! Who's in charge here? Unless you swim in the gene pool of John Milton, chances are your first draft will be an odiferous compilation of goobers, repetitions, awkward transitions and holes. Just do the math and keep moving forward. 4 pages a day for 100 days is 400 pages and roughly 100,000 words. I write Monday through Friday, print on Friday, edit over the weekend in red, and enter changes on Monday. Then I reprint and put it aside for reference. Use the old noodle. If Uncle John had the flu in Chapter Two, remember to ask how he's feeling in Chapter Three. When your first draft is complete, let it rest for a few weeks and then read it again in one fell swoop. The sooner you understand what to do, the less tortured you will be. With that red pen, ask yourself - Does every scene help move the story forward? Are all characters critical to the story? Did you repeat yourself? Do your characters stand on their own? Can you tell who's talking without knowing who it is? Are you rambling like I am now? Did you say quintessential more than once in the book? Are there surprises for the reader? Did you balance dialogue with narrative? Use that red pen! Be brutal! If you find an agent before a publisher or the other way around, it doesn't matter. What you need is a home in the publishing world. My best advice is to network, network, network. Go to writer's conventions and workshops, talk to other writers, read everything about publishing and what is going on so that you are well informed. Declare your genre and stick with it. Be prepared to help your publisher sell your work too. Be open to criticism and take it in the right spirit. Be professional about everything you say and do. Never forget the most important thing is the work - a polished manuscript is the stuff of editor's dreams. 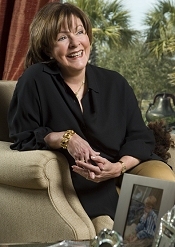 Dorothea Benton Frank is the author of 8 NY Times best selling novels – Sullivan's Island, Plantation, Isle of Palms, Shem Creek, Pawley's Island, Full of Grace, The Land of Mango Sunsets and The Christmas Pearl. Ms. Frank is an ardent advocate for literacy and education.